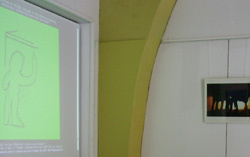 This animation is a response for a call for artworks in an exhibition and festival on both sides of the checkpoint at Ledras Street in Nicosia Cyprus in May 2009. The call asked for works that related to peace and my contribution consisted of two works, this animation which which ran continuously in a loop and a performance on a wall of a building used for city exhibitions and information which was next to the border. The animation which finishes with the text in English and Spanish: "And these realities of things, though in the utmost diversity, are yet intimately connected one with the other"
As a viewer, you have to work out your own message. The quotation which comes from the Bahai writings, could refer to the changing elements in the animation or it could refer to a narrative that seems to spin off in several directions at once. At a point elephants surface and seem more human than the people in the animation, in the sense that they seem to be more free from the constraints of the world around them. This freedom is as much a message about free will as about peace, because peace is chosen and created by society. The song, Son Maloso, by Colombian David Dely + the band, Tumba y Quema, currently based in Budapest, Hungary shares similiar sentiments. Son Maloso means "cheeky song" and the lyrics are phrases taken from various sources and thrown together in the spirit of making something new out of odd bits and pieces. The phrase "como dijo Lisa" (as Lisa says) refers to a metaphoral muse - a source of inspiration for the singer. The animation in a similar fashion shows diverse people and differing locations, like flashes of memory leaving it up to us to find our own stories, including what to make of the elephants who appear (in the room) and move on.